Jenji Kohan’s women-behind-bars Netflix series Orange is the New Black helped solidify Netflix as a provider of original content. The critically acclaimed series returns for season two on June 6th. Check out the trailer after the jump. The highly-anticipated second season of Netflix’s ORANGE IS THE NEW BLACK goes back behind bars for another sentence with the fearless, funny and unforgettable inmates of Litchfield prison. 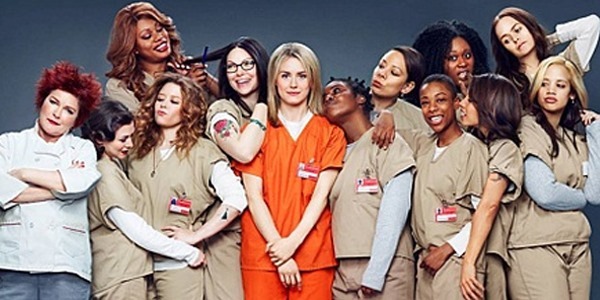 The series’ ensemble includes Taylor Schilling, Jason Biggs, Laura Prepon, Kate Mugrew, Danielle Brooks, Uzo Aduba, Natasha Lyonne, Taryn Manning, Laverne Cox, Michael Harney, Samira Wiley, Yael Stone and more. Lorraine Toussaint joins the cast in season two as Yvonne "Vee" Parker. Season two is exclusively on Netflix in all territories on June 6, 2014. Netflix members can watch season one of the award winning show http://netflix.com/orangeisthenewblack. Recognized by AFI as one of the Top 10 Programs of the Year and recently recognized with a Peabody Award, ORANGE IS THE NEW BLACK is from Lionsgate Television, executive produced by Jenji Kohan and based on Piper Kerman’s best-selling book of the same name. Previous PostBehind The Scenes Look at Guardians of the Galaxy!Next PostHarmonizing Trailer: Clint Eastwood’s Jersey Boys!